Hawkins, in Elena Delle Donne's (knee) absence, will draw the start for Friday's playoff matchup against the Dream, Lindsay Gibbs of Think Progress reports. Hawkins has scored 21 points in 37 minutes thus far in the playoffs. But, in starting for Delle Donne, she's in a position to see more run and garner higher usage. Hawkins didn't score (0-2 FG, 0-1 3Pt) during the 78-75 playoff loss against the Dream on Tuesday. Coming off back-to-back double-figure scoring outings in the playoffs, it was odd that Hawkins only attempted two field goals during the loss. Prior to Tuesday's performance, she was averaging 10.5 points and 2.0 rebounds this postseason. Hawkins dropped 11 points (3-5 FG, 1-3 3Pt, 4-4 FT), four rebounds and one assist during Sunday's playoff win over the Dream. For the second straight outing, Hawkins scored in double figures as she managed a decent 11 points Sunday while shooting 60.0 percent from the field. So far this postseason, the fourth-year pro is averaging 10.5 points and 2.0 rebounds across two playoff games. Hawkins posted 10 points (3-7 FG, 2-5 3Pt, 2-2 FT) and one steal during the Mystics' home playoff win over Los Angeles on Thursday. This was actually Hawkins' highest scoring outing in almost three months, as she managed double figures for the seventh time this season with 10 points Thursday. The former Maryland standout averaged 6.3 points and 3.5 rebounds across 32 appearances during the regular season in 2018. Hawkins (knee) has been cleared to play during Friday's matchup against the Sparks. Hawkins sat out Wednesday's game against the Fever and also Thursday's practice due to sore knees, but the time off apparently did her some good. On the season, she's seeing 16.5 minutes per game and is averaging 6.2 points and 3.5 boards on 43.5 percent shooting. Hawkins (knees) sat out Thursday's practice, but is considered probable for Friday's tilt with the Sparks, Ava Wallace of the Washington Post reports. Hawkins missed Wednesday's contest for precautionary reasons, as she was apparently dealing with some soreness in both her knees. It's a little concerning that she didn't return to practice on Thursday, just a day before game day, but it appears the team is still confident she's ultimately able to take the court. It will be a situation to monitor up through pregame warmups, but if Hawkins does take the court, she'll provide some solid depth after averaging 6.2 points and 3.5 rebounds across 16.5 minutes up until this point in the season. Hawkins is dealing with sore knees and has been ruled out for Wednesday's game against the Fever, Andrew Joe Potter of The Score reports. The Mystics have already locked up a spot in the playoffs, so it seems likely Hawkins is simply getting the night off for added rest. She'll have another few days prior to Friday's tilt with the Sparks, but it's unclear whether or not Hawkins will be back in the lineup at that point in time. Joining Hawkins on the sidelines will be Ariel Atkins, who is out with a hip injury. Hawkins provided five points (2-4 FG, 1-1 3Pt), three rebounds, one assist and one steal during the Mystics' 100-77 home win over Seattle on Thursday. In just under 15 minutes of action off the bench, Hawkins played well in the win Thursday, draining a three-pointer while adding tallies in almost every other statistical category. In 29 appearances so far this season, Hawkins is contributing 6.4 points and 3.6 rebounds per outing. 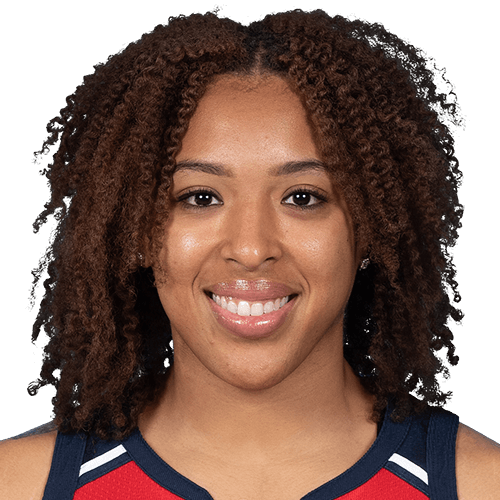 Hawkins had eight points (3-8 FG, 0-2 3Pt, 1-1 FT), three rebounds, one assist and one steal during the Mystics' 88-60 crushing of the Dream on Tuesday. Hawkins had a decent outing during the win Tuesday by tallying at least one mark in four out of the five major statistical categories and by reaching eight points on 37.5 percent shooting. Across 12 games so far this year, the 27-year-old forward is averaging 9.8 points per performance with four starts. Hawkins tallied 10 points (5-9 FG, 0-2 3Pt), five rebounds, one assist and one steal during Sunday's 88-64 loss to Connecticut. Hawkins managed double figures for the fourth straight outing as she drained five-of-nine field goal attempts while adding a few other statistical contributions during the loss Sunday. The 27-year-old forward has started the last four games due to the illness of Elena Delle Donne and is currently averaging almost 10 more minutes per game than last season's career high.